"Book One: Course of Empire"
This is a story of the might of the Cynosure, an Empire whose millions of grubbing fingers grip the surfaces of hundreds of worlds. It is the penultimate Corporate Entity at its height of power and arrogance, devouring itself from within and without. If you’re expecting maybe to follow one person in this story on their heroic battle to make the world a better place, one sword thrust, gun shot, or bomb blast at a time, then I must warn you that it is not that kind of story. That would be too limiting, and would not reflect the nature of war as it will be (or more hopefully will not be) fought in the future. If you came here from a specific one of my other web novels expecting more of the same, I must say you will not find it here. What you will find is a well crafted serial, worthy of equal attention. This is a story woven from strands of information spanning thousands of light years, pulled from dozens of worlds, and shaped across bends in space and time. This story enters and leaves the lives of many characters, some of them human, some of them alien. Shadow and Mist has not been tagged yet. 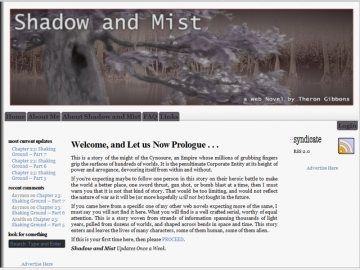 Help others find Shadow and Mist by tagging it! Shadow and Mist has not been reviewed yet. Shadow and Mist has not been recommended yet.